Eagle Mountain Assisted Living offers much more to the seniors in this area than just a place to live, it is a place for living and enjoying life! This spacious community has 46 one and two bedroom suites, five common areas with fireplaces, gracious amenities and numerous services. The residents also enjoy the Home Theater, a walk-in whirlpool tub, a walking track and a beautiful water feature. 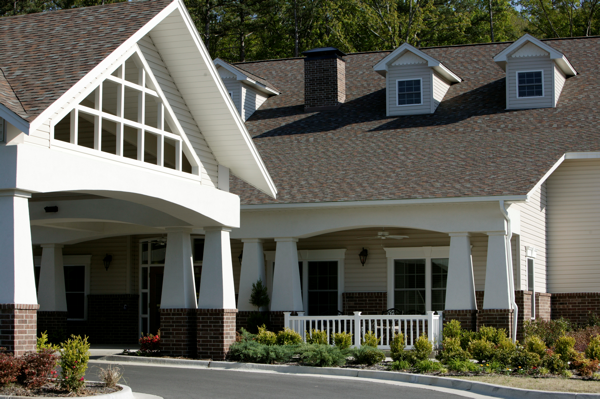 Eagle Mountain Assisted Living is nicely tucked away on 7.7 acres in a generously wooded area near the eastern edge of Batesville, Arkansas. It is located about 95 miles north of Little Rock. Living your life to its fullest includes taking good care of yourself. We help you do that through our innovative approach to “Wellness” Taking care to help keep you healthy and well. Assisted Living is the perfect alternative for seniors who no longer want to maintain a home, a lawn, and the many repairs that must be done. Our approach provides the ideal solution for seniors who may or may not need help with daily activities. We focus on keeping our residents as independent as possible by providing a tailored plan of assistance. Our residents enjoy beautifully appointed suites, delicious well-balanced meals, engaging social activities, transportation, and personalized assistance and care. At Eagle Mountain Assisted Living our most important asset is people. We are a company of people serving other people. With the vision of White River Area Agency on Aging and a strong commitment to the health and happiness of seniors, Eagle Mountain Assisted Living was established.